Lakeland & Winter Haven - Call our 24/7 cell phone anytime. We are based in Polk County and the entire Lakeland / Winter Haven area. There are many Lakeland pest control companies, but most deal with extermination of insects. We deal strictly with wild animals, such as raccoon, skunk, opossum, and more. Affordable Wildlife Removal differs from the average Lakeland exterminator business because we are licensed and insured experts, and deal only with animals. We are not merely trappers, but full-services nuisance wildlife control operators, offering advanced solutions. Lakeland wildlife species include raccoons, opossums, squirrels, rats, skunks several species of snakes and bats, and more. Many animals can cause considerable damage to a house, not to mention contamination. We offer repairs of animal entry points and biohazard cleanup and we guarantee our work. Our Lakeland rodent (rat and mouse) control is superior to other pest management companies. All of our wildlife trapping is done in a humane manner. Of course, we are properly Florida state licensed. 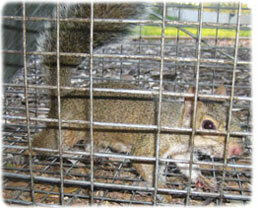 We are highly experienced in Lakeland raccoon removal, squirrel removal, bat control, and more. We at Affordable Wildlife Removal believe we are the best Lakeland trappers of wildlife, and would be happy to serve your Lakeland bat removal or pigeon and bird control needs with a professional solution. Skunks, moles, and other animals that can damage your lawn - we trap them all. 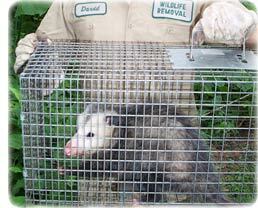 Our professional pest management of wildlife and animals can solve all of your Lakeland critter removal needs. Our specialty is removal of animals in homes such as raccoons in the attic or squirrels in the attic. If you need Lakeland pigeon control, Canada geese or other bird removal, we can help. We are experts with skunk problems, digging animals such as armadillos, & groundhogs, and we offer Florida dead animal removal. We trap mice and voles. We do home repairs, animal prevention, and removal of critters from the attic, ceiling, basement, animal in the wall, and any part of a building. Give us a call at 863-232-5058 for a price quote and more information. Remember, we at Affordable Wildlife Removal run a wildlife removal company, and charge for our services. If you are searching for help with a dog or cat issue, you need to call your local Polk County animal control or SPCA. They can assist you with problems such as a dangerous dog, stray cats, lost pets, etc. There is no free service in Polk County that provides assistance with wild animals. He says K.C., the terrier who was found injured on U.S. 19, escaped from his yard through an open gate. For more information, call the animal services of Lakeland, Florida. The owner of the Jack Russell terrier injured on U.S. 19 has come forward and says he and his family are grateful for all that was done for their pet. Polk County animal control says it will continue to help with domestic animal issues, but not with Florida wildlife problems. Karl The Wild Animal Expert identified himself to the Times on Wednesday and explained the 10-year-old canine's escape from the family home near Spring Hill Drive and U.S. 19. Animal and carcass removal services in Polk County is dedicated to helping Florida and Lakeland. Without carrying its identification, which included its license, the dog could not be placed after it was taken to Polk Animal Hospital on Oct. 25 with various injuries. Polk County animal services in Lakeland, Florida, declined to comment on the matter. If you need Lakeland raccoon removal, rat trapping, squirrel removal, or have any questions about a wildlife problem in Lakeland, please give Affordable Wildlife Removal a call at 863-232-5058, and we will listen to your problem, give you a price quote, and schedule an appointment, usually same day or next day, to solve the problem.